And baby makes three! Congratulations are in order for Amanda Seyfried and her fiancé, actor Thomas Sadoski, as they are expecting their very first bundle of joy! Check out Amanda’s baby bump here and get all the details on how she announced her big news. Amanda Seyfried, 30, revealed that she has a bun in the oven on Nov. 29 at the Givenchy press launch for the brand’s new Live Irrésistible fragrance. Amanda was at the event because she’s the spokesmodel for the fragrance. Though, even if the Mean Girls actress hadn’t made the big announcement, we would have probably suspected something, as her gorgeous mini black Givenchy dress totally showed off her itty bitty baby bump! Amanda is so tiny, that baby bump DEFINITELY would have raised our suspicions. We can’t wait to follow along with Amanda’s pregnancy and see her and Thomas become one big happy family! Will they have a cute little boy or a beautiful little girl? What will they name them? And when is Amanda’s due date? Ah! We’re so excited to get all the details on Amanda’s journey to motherhood. Hrithik Roshan BEATS Shah Rukh Khan to win the Sexiest Man Alive title! 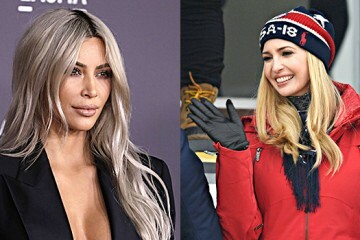 Kim Kardashian’s Secret Chats With Ivanka Trump Revealed: WTF Is Going On?